As we look at the House of Lean, we tend to concentrate on the Foundation and JIT pillar. I’d like to write today about the other pillar – Jidoka for without it, our House of Lean would tilt and the roof would surely come crashing down. Jidoka or autonomation as it is often translated to, really refers to “Built in Quality at the Source” or even more simply – Don’t pass defects on. Many people forget that high quality and Just In Time go hand in hand. There’s no sense reducing lead times just to move defects faster through the value stream. The origins of Jidoka go back to the original Toyoda (correct spelling of the family name) family Weaving Loom business. Before they became famous for making automobiles, the family was in the business of making weaving looms that had a reputation for making cloth of very high quality levels. In the late nineteenth century, people used to sit and watch the weaving machines make cloth waiting for any broken threads which would lead to defects in the cloth. When they saw a broken thread they would stop the machine, repair the thread and restart the machine. Imagine a job like this, watching a machine do the work and reacting only when there was a problem. What a waste. Toyoda saw this and invented a method whereby the weaving loom would self-detect a break in the thread, stop and alert the operators. The operators could then repair the thread and restart the weaving loom. Now one person could operate many looms and the looms would produce only cloth of the highest quality. This is where the term Jidoka came from. Autonomation – automation or machines but with a human touch. Ones that can self-detect errors, stop and alert the operator. Now machines can do what they do best which is detecting defects and humans can do what they do best which is problems solving. By implementing Jidoka, we implement a system that prevents defects from being sent to the next person or operation in the value stream. Now we can begin to introduce JIT and cash in the benefits of reduced inventory and lead time. Jidoka and JIT – we need both pillars to be working hand in hand to truly provide value to our Customers. Whenever you create incentives for people to speed up the flow of work through a process, you run the risk of also creating an incentive to cut corners on quality. Therefore, it's important for management to make it clear, through both words and actions, that quality is truly the first priority. Done right, autonomation can add a layer of transparency and accountability to the whole process. Very true and yet JIT gets a hundred times more attention than Jidoka. Flow starts high quality and the Lean priorities of Safety first and then Quality make complete sense. Interesting that Deming, Juran & Shingo spent far more time on Jidoka than on JIT. Hi my friend! I wish to say that this post is awesome, nice written and include approximately all vital infos. I'd like to see extra posts like this . Thanks Joyce. I'll take your commenta to heart and plan on writing more about Jidoka and building in quality at the source. Without quality nothing else will ever work as you will always be suffering from variation. 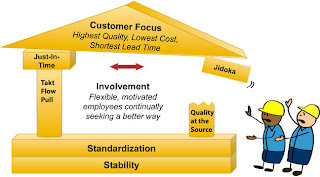 In my mind Jidoka almost belongs as part of the foundation of lean as without it nothing else will work as well as it does. These things are all inter-connected and inter-dependent. That's the definition of a true system. The foundation is Standards & Stability and as we put these in place we naturally reduce varation. I believe Jidoka takes it one step further and gives us processes to engage people in building quality in at the source by preventing errors that cause defects. So true and clever presentation of that truth by you. It's like everyone is skipping over the 2 "A"s of Lean (Autonomation and Autonomous) the popularity of this intro video http://www.youtube.com/watch?v=8eGbtdtJ7TA may help.